DO YOU KNOW PAUL FERGUSON THE FIGHTER? I knew him well. He became the Southern Welterweight Boxing Champion in 1939 at age 23 and defended the title for eleven years. He had 232 professional fights and two thirds of his 214 wins were knockouts. He was never knocked out. He lost 10 fights and had 7 or 8 draws. 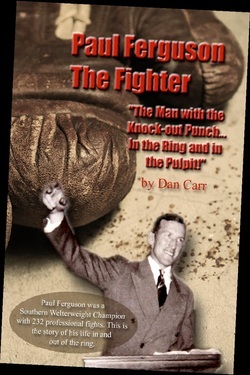 After the 2nd World War he continued boxing and while at the top of his game, he discovered by grasping John 5:24 that a Christian cannot lose his salvation. He lost interest in boxing and turned to the Bible and prayer with the same passion and discipline that he had exercised in boxing. For the rest of his life he focused his whole life on: Draw nigh to God, and he will draw nigh to you… (James 4:8a). He memorized over eight thousand verses but he focused on the verse above. God’s power was upon him as he walked with God. God had called Paul to be an evangelist but he wanted to be a pastor so he could be at home with his family. He argued with God about it for months. One night while working in a railroad switching yard in Greensboro, NC, the overhead lights went out. Paul continued with paperwork on his clipboard, using the light from his headband. Paul studied every Bible passage pertaining to prayer, especially of Jesus, the prophets, the Psalms and the apostles. He spent much time studying the lives of such men as E.M. Bounds, Charles Finney, Praying Hyde, Andrew Murray, A.T. Pierson, John Rice, Lee Roberson, D.L. Moody, R.A.Torrey, Charles Spurgeon, and many others. His favorite study was the life of Jesus and His relationship to the Holy Spirit. One day I went by his house to take some fresh produce. When he finally came to the door he was barefooted and blinking at the bright day behind me. I had disturbed his prayer time. In his hand was a sheaf of papers on which was written the name of over a thousand people he prayed for every day. I knew my name was in that list somewhere. He said he had them memorized but if the Lord prompted him to stop and pray a while for one name, he would put his thumb there so he could easily find the next name. We present Paul Ferguson the Fighter to encourage you to pray through hard times. Don’t give up! Pray for His power and direction in your life and in bearing spiritual fruit. Herein is my Father glorified, that ye bear much fruit; so shall ye be my disciples (John 15:8). The late Dr. John R. Rice wrote 60 years ago: “The drought of death is upon our country, upon our churches; upon our ministry…The trouble is that we do not have the power of God.” In 1969, I heard Dr. Rice say to a thousand preachers in Chicago:“If you preachers don’t learn how to pray, you needn’t bother to learn how to preach.” Deep down, we all know that— but prayer is hard work and we are all…so busy. Jesus promised His power to do His work – (Luke 24:46-49) - (Acts 1:8) (Luke 11:13) etc. The reason we don’t have His power is that we are content to work in our own strength or else we simply don’t want to be bothered with prayer and walking with God. If you would like to get a copy of the book, here's how: Call or Write: The Christian Book Store (910-692-3471) – 156 NW Broad St - Southern Pines, NC 28387. $10 plus $2.00 postage. Use: VISA, Master Charge or Discover Card. Easy reading: 288 pages with 17 pages of pictures. If you are not pleased, return for a full refund. Dr. Lee Roberson read the manuscript and wrote the Foreword. He came up with the title: Paul Ferguson the Fighter. He knew Paul well and believed the accounts recorded in the book.